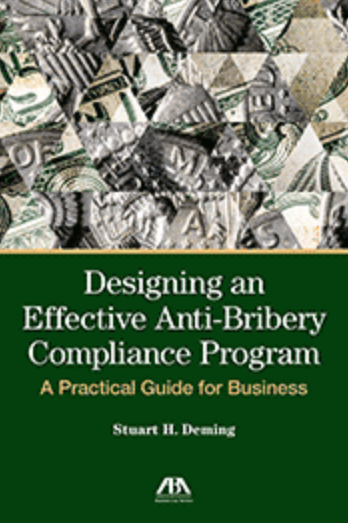 In a single, concise publication, Designing an Effective Anti-Bribery Compliance Program: A Practical Guide for Business successfully integrates the critical factors that require consideration in designing and implementing an effective anti-bribery compliance program. It provides a practical framework that is invaluable in almost any legal setting. Official guidance and enforcement actions of the United State and the United Kingdom are addressed as part of a roadmap for complying with the basic tenants of the FCPA and UK Bribery Act. Yet consideration is given to the critical aspects of other legal regimes as well as the guidance issued by respected international organizations. Included is a checklist of key components of an effective compliance program and sample compliance provisions for third-party agreements. 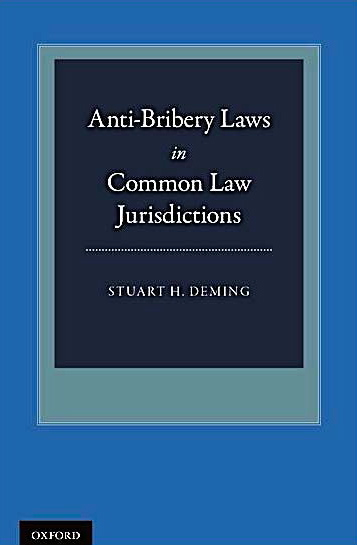 Stuart H. Deming, Anti-Bribery Laws in Common Law Jurisdictions, Oxford University Press (2014). Anti-Bribery Laws in Common Law Jurisdictions provides a comprehensive analysis of the foreign bribery laws and of related laws and regulations in key common law jurisdictions. This book extensively addresses the official guidance associated with the Foreign Corrupt Practices Act (FCPA) and the UK Bribery Act, and explains the related legal obligations that apply to record-keeping practices and maintaining adequate internal controls. Foreign bribery legislation in Australia, Canada, Ireland, New Zealand, and South Africa are also extensively addressed. This book published by Oxford University Press also closely focuses on laws that may expose an individual or entity to private or commercial bribery in foreign settings, as well as to the application of laws relating to money laundering, accounting, and record-keeping practices to situations involving foreign bribery. Throughout, special attention is given to explaining the criteria used in each jurisdiction to establish liability on the part of an entity or organization for foreign bribery. Vivian Robinson QC, Stuart H. Deming, Truman K. Butler, The FCPA and UK Bribery Act: A Ready Reference for Business and Lawyers, ABA Publishing (2013). The FCPA and UK Bribery Act: A Ready Reference for Business and Lawyers was specifically written for laypersons and, in particular, business managers and lawyers with limited knowledge of this area of law. A highly sought best-seller, it is practically oriented. 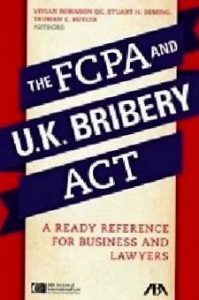 The explanations of the FCPA and UK Bribery Act are concise and easy to follow. In addition, clear guidance is provided in an well-organized format as to what companies, organizations, and other entities need to be doing to comply with each of these broad-reaching laws. Stuart H. Deming, The Foreign Corrupt Practices Act and the New International Norms, Second Edition, ABA Publishing (2010). The Foreign Corrupt Practices Act and the New International Norms, Second Edition, also a best-seller, builds upon the best-selling first edition. Practitioners, corporate counsel, accountants, compliance officials, and anyone engaged in international business are provided with a useful and practical overview of the Foreign Corrupt Practices Act as well as the implications of the international conventions that now bear on the prohibition of payments to foreign officials. 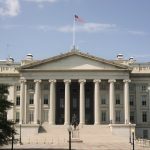 The two principal mechanisms of the Foreign Corrupt Practices Act – the anti-bribery provisions and the accounting and record-keeping provisions – are addressed in a clear and concise manner that makes these complex provisions understandable to the uninformed. At the same time, countless footnotes and the inclusion of key source materials provide useful insights for anyone seeking to understand the nuances of the Foreign Corrupt Practices Act. In addition to providing samples of compliance policies and contract language, extensive practical advice is provided as to how to make compliance programs more effective. Stuart H. Deming, The Foreign Corrupt Practices Act and the New International Norms, ABA Publishing (2005). The Foreign Corrupt Practices Act and the New International Norms was the first publication of its kind to explain in a clear and concise manner the FCPA’s anti-bribery provisions as well as the accounting and record-keeping provisions. How the accounting and record-keeping provisions are applied is described in such a way as to provide practical guidance to practitioners and business managers in designing and implementing effective internal controls and compliance programs. This highly-sought first edition lays out and provides perspective on international developments associated with the adoption and ratification of a host of related international anti-bribery conventions. Leslie A. Benton, Stuart H. Deming, Mikhail Reider-Gordon, Frank A. Fariello, and Christina M. Mitropoulos, “Year in Review- International Anti-Corruption,” 50 INT’L LAW. 403 (Summer 2016). Leslie A. Benton, Stuart H. Deming, Elena V. Helmer, and Mikhail Reider-Gordon and John Magruder, “Year in Review: International Anti-Corruption,” 49 INT’L LAW. 307 (Summer 2015). Leslis A. Benton, Stuart H. Deming, Elena V. Helmer, Mikhail Reider-Gordon and John Magruder, “Year in Review: International Anti-Corruption,” 48 INT’L LAW. 389 (Summer 2014). Stuart H. Deming, “Canada’s Corruption of Foreign Public Officials Act and Secret Commissions Offense, 370 AM. U. INT’L L. REV. 369 (2014). Leslie A. Benton, Stuart H. Deming, Elena V. Helmer, and Mikhail Reider-Gordon, “Year in Review: International Anti-Corruption,” 47 INT’L LAW. 367 (Summer 2013). Stuart H. Deming, “Internal Controls and Anti-Bribery Compliance,” 3 GLOBAL BUS. L. REV. 103 (Fall 2012). Stuart H. Deming, “The UK Bribery Act,” 24 MICH. INT’L LAW. 4 (Fall 2012). Stuart H. Deming, “The Oil Industry in Africa: The Expanding Reach of the Foreign Corrupt Practices Act,” 4 L. & DEVELOPMENT REV., Issue No. 3, Art. 10, 311 (2011). Elena Helmer and Stuart H. Deming, Non-Governmental Organizations-Anti-Corruption Challenges and Risks, 45 INT’L LAW. 597 (Summer 2011). Stuart H. Deming, “Anti-Bribery Enforcement: Significant Developments in More Settings,” 40 INT’L LAW NEWS 2 (Spring 2011). Stuart H. Deming, “FCPA Prosecutions: The Critical Role of the Accounting and Record-Keeping Provisions,” BUS. LAW TODAY (Aug. 2, 2010). Stuart H. Deming, “International Accounting Standards,” 40 INT’L LAW. 363 (Summer 2006). Stuart H. Deming, “The New International Norms Created by Various Anti-Corruption Convention Initiatives,” presented at ABA’s Section of International Law’s 2006 Spring Meeting in New York, New York. Stuart H. Deming, “The Potent and Broad-Ranging Implications of the Accounting and Record-Keeping Provisions of the Foreign Corrupt Practices Act,” 96 NORTHWESTERN J. CRIM. L. & CRIMINOLOGY 465 (2006). Stuart H. Deming, “International Financial Reporting Standards, Their Importance to U.S. Business and Legal Practice,” 84 MICH. B.J. 14 (Dec. 2005). Stuart H. Deming, “The Central Role Placed on the Accounting and Record-Keeping Provisions of the Foreign Corrupt Practices Act by Sarbanes-Oxley,” presented at ABA’s Section of International Law’s 2005 Fall Meeting, Brussels, Belgium (Nov. 2005). Stuart H. Deming, “The Foreign Corrupt Practices Act: The Impact of Sarbanes-Oxley and Other New Developments,” 18 MICH. INT’L LAW. 4 (Fall 2005). Stuart H. Deming, “The Foreign Corrupt Practices Act: Disclosure Issues Associated with Responding to Potential Violations,” presented in conjunction with the ABA-CLE’s FCPA Compliance and Enforcement Series Session on Internal Investigations and Disclosure Issues in the Wake of Sarbanes-Oxley and the SEC’s 21(a) Report (June 21, 2005). Stuart H. Deming, “Foreign Corrupt Practices Act and the New International Norms,” 35 THE LAWYER’S BRIEF (BUSINESS LAWS, INC.) 4 (Feb. 28, 2005). Stuart H. Deming, “Sending Employees Abroad: Legal Considerations,” presented at a program of the International Law Section of the State Bar of Michigan on Sending Employees Abroad: What Employers and Employees Need to Know in Detroit, Michigan (Mar. 2, 2004). Stuart H. Deming, “Foreign Corrupt Practices Act,” 15 CAL. LITIGATION 39 (2002). Stuart H. Deming, “The Role of International Conventions in Fostering Trade,” presented at an international conference on Legal Perspectives of Vietnam’s Integration into the World Economy sponsored by the University of Danang and the United States-Vietnam Foundation in Danang, Vietnam (July 1, 2002). Stuart H. Deming, “The Foreign Corrupt Practices Act,” presented at Insight’s 4 thAnnual Comprehensive Course on International Business Transactions in Chicago, Illinois (Apr. 15-16, 2002). Stuart H. Deming, “The Foreign Corrupt Practices Act: The Accounting and Record-Keeping Provisions,” presented at the ABA’s National Institute on The Foreign Corrupt Practices Act and the OECD Convention: Mitigating and Managing Risks in the Changing Legal Environment in San Francisco, California (Mar. 21-22, 2002). Stuart H. Deming, “Foreign Corrupt Practices Act: The Accounting and Record Keeping Provisions,” BUSINESS LAWS, INC. (FCPA) § 112.001 (2001). Stuart H. Deming, “The Foreign Corrupt Practices Act: The Accounting and Record-Keeping Provisions,” presented at the American Conference Institute on the Foreign Corrupt Practices Act in Washington, D.C. (Dec. 3-4, 2001). Stuart H. Deming, “The Foreign Corrupt Practices Act: The Accounting and Record-Keeping Provisions,” presented at the ABA’s National Institute on The Foreign Corrupt Practices Act and the OECD Convention: Mitigating and Managing Risks in the Changing Legal Environment in Miami Beach, Florida (Mar. 15-16, 2001). Stuart H. Deming, “The Foreign Corrupt Practices Act: The Accounting and Record-Keeping Provisions,” presented at the American Conference Institute on the Foreign Corrupt Practices Act in Washington, D.C. (Dec. 11-12, 2000). Stuart H. Deming, “The Foreign Corrupt Practices Act: The Accounting and Record-Keeping Provision,” presented at the Third Annual International Symposium on the Implementation of the OEC Convention on Combating Bribery of Foreign Public Officials in International Business Transactions and Developments in Money Laundering and Bank Secrecy Laws in Bruges, Belgium (Sept. 14-15, 2000). Stuart H. Deming, “Compliance Programs: A Legal Necessity for Companies Engaged in International Business,” 12 MICH. INT’L LAW. 15 (Fall 2000). Stuart H. Deming, “1999 International Legal Developments in Review: Foreign Corrupt Practices,” 34 INT’L LAW. 675 (Summer 2000). Stuart H. Deming, “The Foreign Corrupt Practices Act: The Accounting and Record-Keeping Provisions,” presented at the ABA’s National Institutes on the Foreign Corrupt Practices Act: How to Comply under the New Amendments and OECD Convention in Marina del Rey, California and Coral Gables, Florida (Feb. 19 and Mar. 12, 2000). Stuart H. Deming, “The Foreign Corrupt Practices Act and the Emerging International Norms,” presented at a program of the International Law Section of the State Bar of Michigan on Basic Compliance Issues: Export Controls, Economic Sanctions and the FCPA – Part I in Birmingham, Michigan (Dec. 14, 1999). Stuart H. Deming, “1998 International Legal Developments in Review: Foreign Corrupt Practices, 33 INT’L LAW. 507 (Summer 1999). Stuart H. Deming, “Corporate Governance from an Auditing Perspective,” presented at the 36th Annual General Meeting of the Pacific Basin Economic Council in Honolulu, Hawaii (Mar. 18, 1999). Stuart H. Deming, “The Foreign Corrupt Practices Act and the Emerging International Norms,” presented at the Forbes Construction Super conference in Miami, Florida (Dec. 11, 1998). Stuart H. Deming, “Vicarious Liability under the FCPA and the Emerging International Norms,” presented at the Insight program on Compliance and Risk Management for International Business Activities in New York, New York (Nov. 12-13, 1998). Stuart H. Deming, “The Foreign Corrupt Practices Act and the Emerging International Norms,” presented at a program of the Section of Business Law on Dealing with Corruption in Capital Markets and the Global Economy: Development and Enforcement of Legal Standards to Counter Corruption in International Trade and Business at the 1998 ABA Annual Meeting, Toronto, Canada (Aug. 4, 1998). Stuart H. Deming, “1997 International Legal Developments in Review: Foreign Corrupt Practices, 32 INT’L LAW. 463 (Summer 1998). Stuart H. Deming, “An Overview of the Foreign Corrupt Practices Act and the Emerging International Norms” presented at a program of the International Law Section of the State Bar of Michigan on the Foreign Corrupt Practices Act-A Practical Guide to Competing and Complying in International Markets in Birmingham, Michigan (Mar. 20, 1998). Stuart H. Deming, “The Foreign Corrupt Practices Act: Responding to Potential Violations,” presented at theForbes Conference on World Infrastructure Projects (Mar. 1998). Stuart H. Deming, “The Foreign Corrupt Practices Act: The Accounting and Record-Keeping Provisions,” presented at a program of the ABA’s Section of International Law and Practice’s Program on Doing Business Worldwide (Feb. 18-20, 1998). Stuart H. Deming, “1996 International Legal Developments in Review: Foreign Corrupt Practices, 31 INT’L LAW. 695 (Summer 1997). Stuart H. Deming, “Addressing Foreign Corrupt Practices: The Emerging International Norms,” presented at the ABA’s National Institute on the Foreign Corrupt Practices Act: How to Comply and Compete in International Markets in Marina del Rey, California (Feb. 21, 1997). Stuart H. Deming, “Implications for U.S. and Foreign Firms: The OECD Initiatives, the OAS Convention, and the New World Bank Guidelines,” presented at the American Conference Institute on the Foreign Corrupt Practices Act in Washington, D.C. (Nov. 21, 1996). Stuart H. Deming, “The Foreign Corrupt Practices Act and the New International Norms,” presented at a program of the Going International Series of International Section of the State Bar of Michigan on Issues for Investment in Today’s Russia and the Newly Independent States (NIS) in Dearborn, Michigan (Nov. 20, 1996). Stuart H. Deming, “The New International Norms: How Will They Affect Your Company?” presented at the Institute for International Research’s program on Doing Business under the Foreign Corrupt Practices Act in Chicago, Illinois (Oct. 24-25, 1996). Stuart H. Deming, “European Union’s Product Standards: Opportunities for U.S. Firms,” 25 ENTERPRISE 8 (July 1996). Stuart H. Deming, “War Crimes and International Criminal Law,” 28 AKRON L.R. 421 (1995). Stuart H. Deming, “Practical Considerations in Providing Guidance on Foreign Corrupt Practices Act Issues,” presented at the American Bar Association’s Section of International Law and Practice Second Annual Midwest International Law Forum on Doing Business Worldwide in Chicago, Illinois (Oct. 13, 1995). Stuart H. Deming and Mark Rossow, “Auditors Responsibility to Report Fraud,” 2 EDP AUDITOR J. 25 (1989). Stuart H. Deming, as one of a number of co-authors, “Report to the Washington Foreign Law Society on the UNCITRAL Model Law on International Commercial Arbitration,” 3 OHIO S. J. DISPUTE RESOLUTION 303 (1988). Stuart H. Deming, one of the drafters of the International Model Petroleum Service Contracts published by the Association of International Petroleum Negotiators (AIPN) in 2002 (http://www.aipn.org/ ) as the result of an AIPN Project undertaken in conjunction with several international energy associations, including the Petroleum Equipment Suppliers Association and the International Association of Geophysical Contractors. Stuart H. Deming, one of the principal authors of the ABA Recommendation on the Inter-American Convention Against Corruption, 31 INT’L LAW. 1121 (Winter 1997). Stuart H. Deming, one of the principal authors of the ABA Recommendation on Corrupt Practices in the Conduct of International Business, 30 INT’L LAW. 193 (Spring 1996). Stuart H. Deming, Secretary to Special Task Force of the ABA Section of International Law and Practice and one of the principal authors of Report on the Proposed Rules and Evidence of the International Tribunal to Adjudicate War Crimes Committed in the Former Yugoslavia, published by the ABA’s Section of International Law and Practice (1995). Stuart H. Deming, Secretary to Special Task Force of the ABA Section of International Law and Practice and one of the principal authors of Report on the International Tribunal to Adjudicate War Crimes Committed in the Former Yugoslavia, published by the ABA’s Section of International Law and Practice (1993). Stuart H. Deming, principal drafter of Recommendation and Report of the American Bar Association establishing a Blue Ribbon Committee on the Establishment of an International Criminal Court, 25 INT’L LAW. 810 (1991).